Chicago, IL – Thresholds has stated that we oppose any national healthcare legislation that reduces the number of insured individuals or reduces Medicaid funding and benefits. More than 5,000 of our 15,000 clients gained coverage through Medicaid Expansion under the Affordable Care Act (ACA or Obamacare), all of whom are living with serious mental illnesses and complex medical needs. Yesterday, many of our fears about the repeal of the ACA were confirmed. 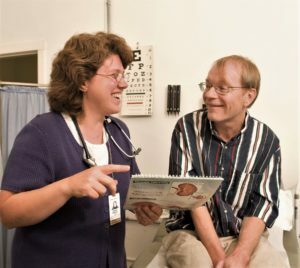 According to the analysis produced by the Congressional Budget Office (CBO) and the Joint Committee on Taxation (JCT), non-partisan governmental units, if the House Republicans’ plan (American Health Care Act, or AHCA) is passed an estimated 24 million Americans will lose health coverage by 2026. This will push the total number of uninsured Americans to 52 million. In the first year alone, 14 million Americans will lose coverage. The analysis from the CBO and JCT makes it clear that the biggest losers under the AHCA are older, sicker, and poorer Americans. The analysis also shows a major federal disinvestment in Medicaid, the largest payer for mental health and substance use treatment, totaling $880 billion in cuts over a 10-year period. Federal cuts of this magnitude would result in hundreds of thousands of Illinoisans losing access to treatment and healthcare. Illinois would be hamstrung in its ability to address the opioid epidemic and undertake significant mental health reforms. This is unacceptable. The proposed repeal of the ACA will be devastating to Illinois. Last week House Republicans pushed a package of bills through Congressional committees in spite of the CBO and JCT not yet having completed their analysis. The premature passage of these bills out of committee puts us one step closer to the loss of health care coverage for millions living with mental health and substance use conditions. Before the ACA, far too many living with mental health and substance use conditions were unable to access treatment until their illness had become debilitating. We can’t go back. Our elected officials must do better. Mental health and substance use conditions are treatable and recovery is possible. Significant progress toward expanding access to treatment was made under the ACA. Now is not the time to pull the rug out from under those who are working to reclaim their lives. As it stands, the AHCA is fundamentally flawed. We join advocates, providers, and those with lived experience across the country in calling upon the President and Congress to uphold their commitments to ensuring that all Americans have affordable coverage and access to the care they need. To stay up to date on this and other public policy matters, please sign up for our mailing list. You can share your ACA story and get involved with our statewide coalition ProtectOurCareIL for additional updates and information on protecting health coverage and Medicaid. This entry was posted in News and tagged aca, advocacy, AHCA, chicago, healthcare, mental health, mental illness, obamacare, policy, ryancare, statement, Substance Use, trumpcare. Bookmark the permalink.